Beef when selected carefully achieve a quality that will never be reached by the large over-sized production companies. 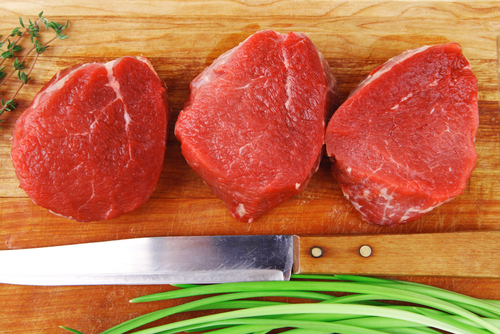 Rare breeds such as Dexter beef, British white and other animals give a very juicy steak. That is why all our beef is either Free range slow grown rare breed or free range organic and when we say its beef, it really is beef. The British White ; Winston Churchill loved this beef and during the second world war he insisted that some of the breed were shipped to America in order that it should survive. Other breeds we use are Red poll, limosin, Aberdeen angus and Hereford. TOP TIP: To avoid over cooking of steaks, heat you plates and allow some resting time and by the time you serve your steaks will be perfect.